As we have seen in the last post, the first step is to describe the Web service model in one common XML file. So, Start Visual Studio, and create a new C# project (of any type for this tutorial) in a new solution. Add a new empty XML file at the root of the project. This file will contain our model description. 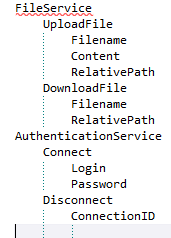 In this file, describe your webservices as you like. In my example, I stayed with the declaration I used in the last tutorial, cleaned some tags and added some comments to it. Now, we will start by generating one contract for each webservice declared in the XML file. In your project, add a new “Text Template” item called WebServiceContractGenerator.tt at the root of the project. We will be generating a C# interface in a “.cs” file, so change the “extension” parameter to “.cs”. We will also need to access the “Host”, so change the “hostspecific” parameter to true. I will explain what the Host is later. As we will read XML, we will have to load Linq and XML .NET Assemblies: System.Xml.dll and System.Xml.Linq.dll. We will also have to use Linq and XML existing namespaces of those assemblies. For CLR references, you cannot just add those DLLs to the current project references as we will need those references when we execute the script file using Visual Studio, not when the current project is run. T4 adds specific tags to specify which DLL must be loaded in order to be able to parse the current script files. These tags must be added right at the head of the file. For namespaces, you would probably want to add them directly in the script as in a usual C# code file, but it is not possible that way. You have to use other tags to specify which namespaces are imported, at the top of the file. Now, we will have to load the XML file, and parse it. Then, we can construct a model that on which we will iterate to output all our C# interfaces. This is a place where anonymous classes come handy. Now, we can check if our model is loaded successfully. Insert this temporary code (this code will be removed later on). So, at this state, the model is well loaded, and can be used to output relevant information. So, let’s output real contracts ! You can remove the last part of the script as we won’t use it (obviously).